Home / Mayo Alanen – How To Create Your Own Art On The Dance Floor! Mayo Alanen – How To Create Your Own Art On The Dance Floor! Mayo Alanen is ranked second in the world and was a featured professional on Dancing With the Stars. He is incredibly dedicated to the success of his students and well respected in the dance community. A talent scout spotted him at the Emerald Ball and he was on the show a year later. Alanen now lives in New York and has students from all over the continent who enjoy learning from him as he teaches professional ballroom dance, specializing in American Smooth. He donates to charity by competing often and is passionate about bettering the community around him. Make the world a better place – through dancing! We agree when he says you should take your art and truly make it your own. Of course there is a time to ask for help, or to strictly follow an expert’s advice. However, we adore the emphasis he places on really taking your art and making it mean something to you. Each participant has a unique view that makes them special and memorable. He sees his students and other dancers as equals, and believes in all of them. Alanen mentions a charity he created with one of his students. He and Aiyesha Dey donate their winnings to a different charity, giving them a bigger purpose and motivating them to work harder. Join them as they help the world around us with programs like Meals On Wheels, supporting seniors that are living in solitude and hunger. They also worked with Dancing Dreams to raise funds that provided disabled children weekly dance therapy classes. Donations are also given to the Child Welfare project that supports underprivileged children in Bengal, India. The charity purchases school uniforms, meals, extracurricular activities, and study materials. We have the privilege of sharing with you an interview from Jenell Maranto! 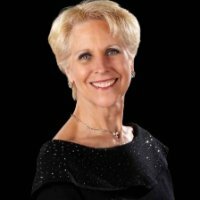 She is the owner and teacher with Jim Maranto of the Academy of Ballroom Dance in Phoenix, AZ. 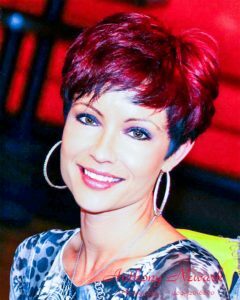 Jenell is a Fellow of the Imperial Society Ballroom Branch and has produced numerous US Ballroom Champions. She is also a DVIDA examiner. Let’s begin with, what was the most challenging dance routine you have performed or learned? Every performance is challenging for me because I’m always nervous. My favorite thing is competition. Competition is fun and makes me happy Being alone on the floor performing is not as satisfying. When I saw Australian Ballroom Champions Kerry Wilson & Ann Harding perform in 1981 in Reno Nevada, I knew I had to lean how to ballroom dance. What is your most memorable experience in dance? Once a mind has been stretched, it never regains its original shape. When judging Pro/Am I look for; Assured footing, balance over ones own feet, musicality, body stretch, and partnership. What considerations go into turning Pro? I was already a professional dancer before I learned ballroom so I didn’t know I had a choice but when my Pro/Am student – Jim Maranto won the U.S. American Smooth Championship we decided to turn Pro together and compete with the big kids. I already owned my own dance studio and Jim joined me and started teaching. It was a great decision for both of us. And finally, what would you like to tell dance students that you wish you knew when you started dancing? No regrets, being in the ballroom dance business has always been great for me. To learn how to keep moving forward in the face of adversity, keep reading. David Hamilton had many roadblocks to overcome to reach the success he has today. Firstly, at the peak of his career, his partner Olga Foraponova decided to stop competing in Dancesport competitions to start a family. Having recently grown his status as a professional dancer, he knew if he stopped it would be the death of his career. So for the next few competitions, he competed without a consistent dance partner, which can be risky. On top of this, his entire career David struggled physically. He was born with 6 lower lumbar instead of 5 in his back, causing nerve pain; which was worsened by a car accident. A necessary back surgery reduced his flexibility by 33% in his back. He knew even then, to give up at that moment would have been the end of everything he had worked toward. Even with discomfort and charlie-horse like pains in his legs that he felt during a final Viennese Waltz competition that would define his championship title, he won 2nd place! What does he credit it all to? Don’t fall into the trap of learning to accept something as it is if it isn’t what you want. Design your life with intent, and reject what does not fit. Be quick-witted. Navigate intelligently and consider the consequences of your next step to the best of your ability. Be self aware. Appreciate your strengths, accept your weaknesses, and define yourself with both of these in mind. Advocate for yourself as a professional. Stand up for what you want and who you are so believably that no one can deny you. Lastly, be grateful. Faith in the future comes from knowing what good can come of doing what you’re afraid of, or what is difficult. You will never feel like good things are in your future until you appreciate what you have already experienced, and decide that you want more. Now, through his Persistence, David Hamilton is an American Style Smooth Champion with the national time with his first partner, Teresa Shiry. That title is followed by two more with Olga Foraponova. He also has three World Showdance finalist titles and 68 National Dance Council Championship event titles. He does lectures on smooth at competitions and now owns Dance World of Nashville where he coaches. Let’s say you go to the doctor. Your doctor walks in with a ratty t-shirt, shorts, and flipflops. Are you going to trust his opinion? Probably not. How you present yourself is important. In a way, the ballroom gown or suit is almost like a work uniform – designed to send a clear message of your skills and who you are. Donna Hamza explains why her dancers presenting themselves with confidence is the most important part of her work (her dresses are fabulously beautiful as well as you can see here,) in this interview. This is why the most important part of your gown is presenting yourself well. To dress for success means to show your passion, magnifying the best parts of you. As a performer, there is nothing more important. Appearance is about impression, not beauty. This might sound strange coming from the ballroom community. You’ll always see dancers in sparkly dresses, heavy makeup, and spectacularly styled hair. These things are expected, particularly for a professional star. Like any other community closely involved with the beauty industry, it is competitive about appearances, to say the least. It can be easy to be swallowed up in the midst of perfect bodies, tans, slicked back hair and dresses that fit a princess. However, try not to not lose yourself in the endless spiral that is “self improvement”. The gowns should be primarily a form a self expression, rather than a way to compare yourself to others depending on how much skin you’re showing, or how tight your dress is. Donna Hamza shows us that charisma and personality has no weight, no height, no skin color. Wearing ballroom couture, as Donna Hamza states, should suit you. She even goes as far to replace her handmade dresses if she feels it does not suit the dancer because it is that important to represent the person wearing the dress. We all love to play dress up and enjoy the glamour of the ballroom (and who wouldn’t?!) but you are your own best asset as a performer. If you are new to the dance world, it can be difficult to tell dances in the same genre apart. Here’s a quick guide to few in the ever-popular social Latin dance category! Firstly, we’ll start with the simple and casual Merengue dance. Originally a Dominican dance (and the official dance of their country), Merengue is an easy dance to introduce a new student to Latin Dancing. It follows a very steady 1-2-1-2 beat with a simple hip motion that can be built upon later for other types of dance in the future. It’s a very social and lighthearted dancing, not nearly as passionate and intimate as most Latin dances. Cha Cha, or “cha-cha-cha!” is one of the more popular social Latin dances. Made popular in the 1950’s when Americans often visited Cuba. It’s often used danced to with Latin Pop and Latin Rock with moves that are sharp and attention-grabbing. It’s rhythm is easy to master, of course. One, two, cha-cha-cha! But the technique is a bit harder to master. Basic Cha Cha steps consist of a rockstep and chasse. That rockstep and, of course, flourishes and hip movement, this playful dance one of the most loved Latin dances today! Originating from groovy and stylish 1970’s New York, Salsa dancing is a combination of dance styles. It’s based in techniques found in Cha Cha and Mambo with an influence of Swing dancing. The music it’s danced to has influence from African drums. The steps are usually two quick steps and one slow, and more advanced social salsa dancers will add flourishes and turns to add to their performance. Samba originated in Brazil at the beginning of the 20th century. It is danced in 4/4 or 2/4 time and can be danced alone or with a partner. This dance is very popular among Latin dances and is characterized by being danced to Samba music and the slight dropping movement that come with a small dropping action in basic steps. Bachata is another social Latin dance originating from the Dominican Republic, named after Bachata guitar music. It’s a dance that is very close to the body and involves lots of hip swaying and turning. Typically the dance is done holding both hands but it tends to become more intimate, much like the tango. Keep studying different types of Latin Dance and you will be able to recognize them with no problem. Never limit yourself to just the more popular ones! It’s wonderful and fun to know so many kinds of Latin dance and will earn respect among your peers. One of our favorite things about this interview is the emphasis that Forrest Vance has on positivity. Positivity allows you to view yourself with potential. It’s a form of visualization. You see yourself having a chance at success. Of course, positive thinking does not come easily to most people. For most, it’s the opposite of their instinct. It is so easy, particularly as a new dancer, to become overwhelmed and want to quit. So how does one change a mindset from a negative to a positive way of thinking? There’s never one answer that works for everyone, of course. One thing that successful people have in common is to work with pleasure toward their goals. Realize that what you want to do is worthwhile, important, and fun, and that it will continue even if you do not continue with it. Furthermore, by studying it, you become even more worthwhile, important, and fun (well, more so than you already are!). This is not meant to discourage. In fact, it should urge you to chase after what you want before it slips from your fingers! There is so much to learn, so many techniques, so many people who love dancing just as much as you do. What good does it do anyone to stop before you even begin? Do you allow dancing to encourage or discourage you? Do you feel like you’re getting a chance to be part of something you love, getting a chance to be good at something fulfilling? In addition to this wonderful interview of Toni Redpath by Dance Teachers Academy Podcasts, we thought we would throw in a few extra notes for our dancers – whether a beginner who is learning how to present themselves, or an experienced dancer struggling with their confidence. The most popular reaction is, “I’ll never be able to do that!” This view provides low sense of capability for yourself and an untouchable and unattainable talent toward your role model. This viewpoint provides nothing but paralysis and harmful self-criticism. Looking at the role model and saying “I’m better than him/her, he/she just doesn’t know it yet.” This fist-shaking view provides a superiority complex bred of insecurity for you, and dismissal of true value and skill of your role model. While this viewpoint does not lack confidence that is needed to be successful, you will likely feel above learning the building blocks of skills that will allow you to be technically correct in dance. This can cause you to have the reputation of a know-it-all with, realistically, very little knowledge. The healthiest view, which is “How can I do that?” Not only does it give you an honest view of yourself, of all your successes and your shortcomings, it gives you a realistic goal to meet. Only with the “How can I do that?” view can you improve. We know, it sounds cheesy. Are you surrounded with knowledgeable, kind people who are honest with you? Do they build you up when you do something correct and offer you solutions when you’re wrong? Do you recognize your mistakes and congratulate yourself on your success? If you find yourself unable to view yourself as successful, consider what kind of criticism you’re accepting. Be kind to yourself and choose your company carefully. Dancing is supposed to be technically correct, but also FUN!